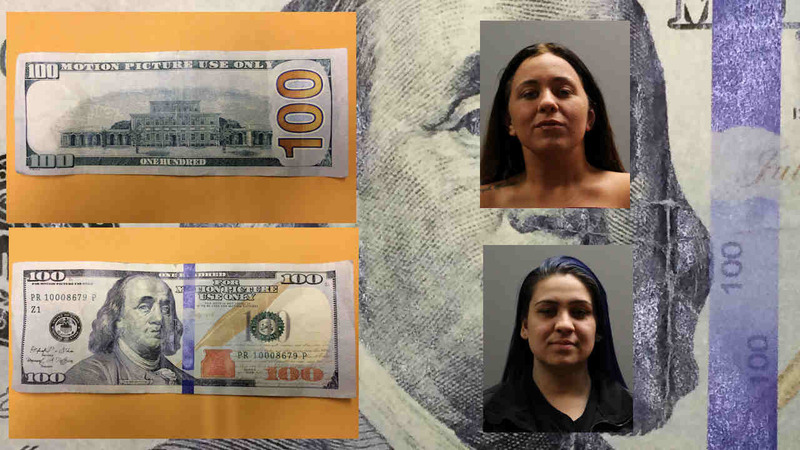 LEVITTOWN, Long Island (WABC) -- Two women were arrested on Long Island, accused of shopping with fake money and trying to exchange fake bills for real ones. According to the Nassau County Police Department, on Wednesday afternoon, Sarah Abraham, 19, of Levittown, and Krystal Joushan, 19, of Hicksville, went into several stores on North Jerusalem Road and tried to pass fake $100 bills off as real ones. Police said the two hit a parked car and a pedestrian with their car while trying to get away. The victim whose vehicle was hit followed the two defendants to Abraham's house where the two suspects were later arrested. The $100 bills had "For Motion Picture Use Only," police said. NCPD said Abraham had used one of the bills on Tuesday at Europa Supermarket in Mineola. Abraham is charged with petit larceny, and Joushan is charged with petit larceny and two counts of leaving the scene of an accident. They were scheduled for arraignment Thursday.